A home Security System is an electronic system that provides monitoring and automatic alerts in the event of threats to your home. Security Systems can range from basic do-it-yourself systems, to very elaborate systems that are monitored by a professional home security company. Monitoring by home Security Systems can include features such as: motion detectors; smoke detection; CO monitoring; door and window monitors; heat sensors; and closed-circuit video recording. 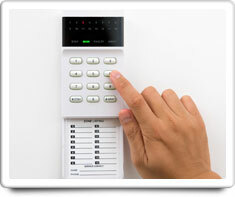 There are five key components to most home security systems: monitors (both motion sensors and door/window contact sensors), control pad, alarm horn, a back-up battery, and it may or may not utilize a remote monitoring system. Shown in the 'Routine Care' section are the recommended routine maintenance tasks for your security system. The 'Q & A' section shows answers to common questions. And the 'Articles' section provides helpful articles about your security system.